My question is whether this may be the cable or if it is a sign of a dead unit. I'm not sure where or how to get a cable. I don't have the skill or parts to make my own and don't want to spend a lot on a gamble. Like I said I will try to get a pic later but just wondering from the experts what you think. Could definable be a cable issue, maybe audio and video is reversed. If your cable is correct then your VDP could be bad. I know you said it was a dirt-cheap TI and I don't know yet if you plan to stick with it or not, but my one and only suggestion for video concerning the TI can be found by ... << CLICKING HERE >>. That sounds like a cable issue. The same cable you can use for the Atari 8-bit computers, C64 and Vic-20 can be used with the TI99/4A....so if you have any of those you can use one from one of those computers as far as I remember. Edited by eightbit, Wed Jul 12, 2017 4:40 PM. I have the C64 RGB cable but I wouldn't have thought that would work. The one I tried was the Genesis AV cable. You mean like a chroma/luma cable? It might if one of the connectors is wired to the proper pin. I have one of those for my C64 (has chroma. luma, audio and composite...four connectors) and I have used it in the past for various consoles and computers...simply testing each connector until I got video! I found an RF box with my commodore 64 stuff and it has the proper pins but this time it gave me a black static screen with a high pitched whine sound. You'll need it anyway down the road. If the TI99 ends up being garbage you can get another for dirt cheap. Mine was $20. I have to say though that I have never had a bad TI99/4A out of quite a few I have had over the years. Edited by eightbit, Wed Jul 12, 2017 6:09 PM. It's a super easy and inexpensive mod. EDIT - You don't have to disassemble the plug like in these instructions, you can just solder the wires. Also, is it PAL or NTSC? Edited by Sinphaltimus, Wed Jul 12, 2017 6:29 PM. Edited by Gip-Gip, Wed Jul 12, 2017 8:10 PM. Even if you're not into soldering you could easily make one yourself for approx. $6. Just tie the RCA cable in a fancy knot around the pins. Edited by Gip-Gip, Wed Jul 12, 2017 8:11 PM. You can get video from the Sega cable but not audio by plugging the audio end into the video jack BUT DON'T PLUG THE VIDEO INTO THE AUDIO as the video will be outputting 12vdc. Just saw your post and tried it - no go. This thing may have other problems then. It seems to me that this pinout chart matches what most people think is correct. That said, the linked cable should work. I'm not sure about the TI-99/4 (non-A) version although the linked page lists it as well. As for Sega Genesis cables, it seems that you would get audio by attaching the RCA plug meant for Sega video into your audio input, but unlike what the TI Guy posted above, I can't figure out how you would get TI video by using a such cable. Not that it matters much since you should avoid using a such cable in the first place. Note though that on the Atari and C64 you would get a B&W image from the luminance signal on pin 1 using a Sega cable in reversed mode, but on TI as well as VIC-20 etc you would be feeding a 5V-12V signal into the TV. To put it in other words: Does your TV or monitor accept S-Video input, and is your intention on the Atari and C64 side to utilize the best possible video mode? If the answer to these questions is yes, you will need one cable for each system. If you are satisfied with the slightly inferior composite video signal, which is superior to RF but not what the professional users will accept, one single cable will meet all your needs. Honestly I don't get where people are coming from about pinouts differing and moving around plugs, unless they specifically are talking about S-Video while it seemed to me that you would be set with composite video. But everyone's milage may differ, and I can only base my reasoning on practical experience and documented pinouts. 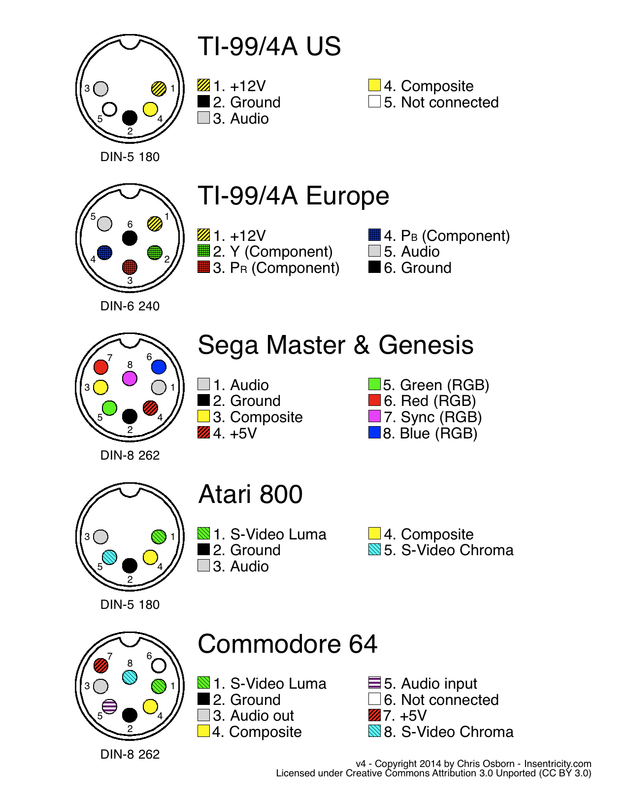 composite is fine for me and honestly it would be more for the Atari and TI99 as I have the chroma/luma cable for the C64 and the 1702 to use it with. The main reason I didn't want to buy separate cables is I'm not even sure if the TI even works and was going to buy an Atari cable anyway but didn't want to use the Atari cable in the TI in case it caused any damage to either the system or tv. I'm not sure that makes sense but I have very little technical knowledge in these matters but from the diagram above I would be concerned with voltage from one pin on one machine and not another. A custom made composite video cable like the one you linked to, would only connect pins 2, 3, 4 and leave pin 1 with its 12V on the TI side unconnected. I would recommend you try to contact the seller to ask exactly how it is wired and that he can vouch for that it will work with the listed systems. The only reason I can see that it wouldn't work is in case every single pinout of the TI video port is reversed, so people somehow have got things backwards when it comes to the TI specifically. That is as far as I can help you.